Twilight Breaking Dawn Part Two opened last Thursday night with 10pm showings. I usually avoid even opening weekends of movies - standing in line for hours is not fun, and rushing in to get a good seat is just gives me anxiety! 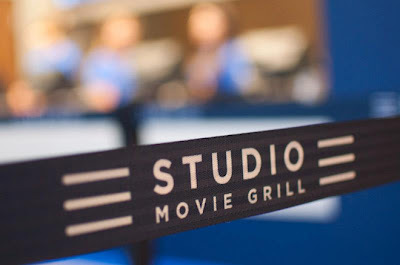 However, I found the perfect solution: Studio Movie Grill! I'd been to the SMG in Scottsdale a few times before; I hear that it's similar to iPic theatres in that you get a big cushy seat and can have snacks and beverages delivered right to you. iPic tickets are pretty pricey though, and Studio Movie Grill offers tickets for the regular theatre rate. In fact, they discount tickets for weekday nights after 10pm so when I went online to buy Twilight premiere tickets for me and two friends, the tickets cost only $5.50 each! I haven't paid $5.50 to see a movie since maybe junior high. I love Studio Movie Grill too! Assigned seating makes life a lot easier. I wish more theaters did that!